Can we ever really go home again? My great grandfather Per Erik Anderson came from Sweden in the 1870s. My great, great grandfather, a Swedish "land-owner," disinherited Per Erik because Per would not give up his romance with a "peasant girl," the milkmaid, Carolina. So Per Erik found himself land-less and homeless in Sweden. And when he heard rumors of free land in America, he headed alone across a wide ocean — looking for a new homeland — eventually bringing his Carolina and their two young children to Wisconsin. One of these children was my Grandpa Eric, just five years old when he left Sweden. By the time he was grown, my Grandpa Erik, also infected with "wander lust," began dreaming of his own land. In 1913 after my grandmother, Anna, had died of the flu soon after the birth of her fifth child, Grandpa Eric took his young family and migrated northwest to Saskatchewan, Canada, to look for land of his own. My father was just a lad of eight that year - when my Grandfather began his homestead on the virgin Canadian prairies. Moving. Searching. Longing. In time, both Grandpa Eric and Dad called it "the home place." Later I would too. When my Mom and Dad married, they began their life together on the land homesteaded by my paternal grandfather, Eric. During my childhood years, I felt that land would be my home forever. I roamed that homestead; explored every square yard of it. Every "coulee" and every hill. Knew which Choke Cherry bushes yielded the sweetest fruit. The draw where the most colorful crocuses exploded from the soil each spring. I could take you to the exact wrinkle in the prairie hillside which hid the coyote pup-birthing den. And the best spots to snare jack rabbits. And the brush patch where hawks nested year after year. Often, I would stand on "the big hill" a mile southwest of our house looking over "our land." Dark winter evenings, I followed Dad to the barn, carrying the lantern as the hard cold snow crunched under our feet. Dad would point to the glistening crystals at the edges of that pool of lantern glow and say, "Look — we are rich. God has covered our land with diamonds." Although my Father tended his land for more than thirty years, in retrospect I wonder if he ever felt completely at home there. Dad loved that land all right, but it was not a permanent dwelling place to him. He held it lightly and for only a short few decades, then left that land, and moved on to different things. I also left that land — way too young. When I was fourteen years of age, since there was no high school near our homestead place, the folks sent me away to a boarding school. I have never really lived "at home" since then. The day I left, Dad drove me and my scuffed old cardboard suitcase twelve dirt road miles to the little village of McCord to catch the east bound morning train. He set the case on the platform then stood quietly and looked at me a long time. He shook my hand. Then cleared his throat. Then he squeezed my shoulders with a hug. Then shook my hand again. He kept repeating this and blinking back tears, his twitching lips unable to form words. Finally, Dad spoke huskily and abruptly, "Be strong son. And... and remember who you are." Then turned on his heel and strode resolutely to the car. As the train pulled out of the station, Dad stood by the old Pontiac watching me leave his life. While that old coach rattled down the tracks, I tried to weep out the big lump in my throat. Somehow I knew that I would never live at home again. Oh yes, I returned briefly during a few summers and blew through for short visits. But, I've never really "gone back home." By the time Mom and Dad died, the "old home-place" had long since passed into the "possession" of others, some of whom are strangers to me. Sometimes, in my nostalgic "home longings," I wish I could bring back a few more childhood years with Mom and Dad. And I often wish I had "our" land back in my "possession." Across the years, at times when bittersweet memories flicker in my soul, I go back to re-walk those hills and try to recapture some "at home" feelings. But, I know that place is no longer my home. Hasn't been in fifty years. In some ways, I think it never really was. The rainbows I've been chasin' keep on fading, before I find my pot of gold. And the feel of a muddy road between my toes. And the smell of Sunday supper on the stove. But in my mind I'm always going home. Guess it runs in the family. Now my youngest son tells me, "I feel homeless." I began to comprehend on profoundly unsettling levels, "home" is not a place! By the rivers of Babylon we sat and wept when we remembered Zion. .... How can we sing the songs of the Lord while in a foreign land? ... May my tongue cling to the roof of my mouth if I do not remember you, if I do not consider Jerusalem my highest joy. There are special places on this earth where some of us have felt peace; places where important memories were born — or that once felt like home way back there at some long ago time. Most of us eventually leave them. We take different roads away from the home place. From time to time we long to go back. But, when and if we ever do get back to that place, we only discover to our sad disappointment that Thomas Wolfe was right, "You can't go home again." Nevertheless, we keep trying. Lord knows I have more than once returned to the homestead of my childhood, trying to "get back home" by walking once again on the land my Grandpa Eric homesteaded. Land where I was born and lived until my early teens, then left never to live there since. But, as the old Stamps-Baxter spiritual says it, "I can't feel at home in this world any more," not even back on the "old home place." Memories of my first attempt to take my children "back home" still bring a lump to my throat. I was all a-jitter with anticipation that day, heading south from McCord, Saskatchewan, down the twelve-mile road toward my childhood home, 17 rangeland miles from Montana. I babbled old family legends the whole way, hoping my children would catch the spirit of the old home place. I wanted them to recapture with me the "home" feelings from long ago. But far before we reached the old home place, things looked wrong. Old dirt roads had disappeared beneath gravel and blacktop. Most familiar landmarks had vanished. Where had these new farmhouses come from? When I was a child, we hailed everyone along this road by name. But now strange faces stared curiously back through pick-up windshields. Even the hills seemed smaller. In spite of these changes, when I drove through the gate onto our land, I still felt intoxicated on a mixture of nostalgia and excitement. Couldn't wait to show my kids the panoramic view from atop "the big hill," where the ancient Indian smoke-signal hearth still keeps watch from that high place. To walk them through the circles of stones where Indian teepees once stood. To climb with them up to the "big spring" that watered our herd. And to the Indian graves that look down from a low hill across the old wheat field and hay slew on the west side. I wanted my children to connect with simple objects from my childhood: the ruins of the 1929 Pontiac, in which I learned to drive, eyes peaking over the dash, feet stretching for the pedals. The old sleigh still resting on a knoll: my sisters and I ran along behind it to warm our toes. Rusty remains of Dad's old grain binder. Object after object, memory after nostalgic memory. We drove down through the gully, past the old well, and up toward the yard where my small boy bare feet used to run. But, I was not prepared for what hit me when we pulled up in front of the old house. Weeds and grass, waist-high, had taken over what had once been Mother's well-kept yard lined with shrubs and flowers. The outbuildings had all crumbled into the past. But the old house still stood — alone — her features weathered by time and vacancy, yet with her personality and character still intact. However, she looked so very forlorn. Remnants of the brick chimney leaned off-angle, about to tumble through a gap where the winds of fifty winters had wiggled shingles loose. Pigeons fluttered out of these holes in the roof. Partly broken windows stared blankly, like the eyes of a lunatic, gone mad with loneliness. For long moments I could only stand and stare back. Time seemed to fall away. I felt my bare feet running though the grass again. Heard my sisters laughing as young girls. Smelled Mom's cooking. Heard Dad's tenor song. An ache several levels deeper than physical pressed around my heart. I reeled under the storm of nostalgia. Then suddenly, like awakening from a dream, yesterday fell away. My children tugged at my coat. "Daddy, why are you crying?" How could I explain to them that here in the very center of my childhood place, I felt anything but at home. Never have words of Thomas Wolfe seemed more poignantly, personally true, "You can't go home again." Home would never be again. Only in memory. Nothing more. For even if the buildings had not decayed it would still have been impossible to get home by coming to this place. The "home-ness" of the "the old home place" is erased forever. My soul felt as empty as that old house. Mom and Dad have long since gone to heaven. They had not been to the home place for at least a decade before they died. One of my sisters is buried a thousand miles away; the living ones scattered across the earth. Even neighbors have died or left. Only "the land" remains the same, yet even it seems different: once tilled for fields, it is now turned back to rangeland and fenced by hands of strangers. That day I began to comprehend on profoundly unsettling levels, that "home" is not a place! The "old home place" is not home. In fact no place is. Not for me, and, I think, not for anyone! Diffie, Joe. "Home." Sixteen Biggest Hits. Sony. All Content Copyright by Lynn Anderson and Howard Publishing Co. This is a book excerpt from Longing for a Homeland for your sampling of great material. Please do not reproduce this article. Do You Have a Barn? © Lynn Anderson. Used by permission. 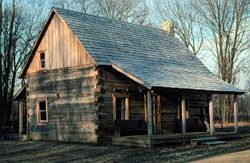 "The Old Home Place" by Lynn Anderson is licensed under a Creative Commons License. Heartlight encourages you to share this material with others in church bulletins, personal emails, and other non-commercial uses. Please see our Usage Guidelines for more information. With all the voices telling you who you are, who will you trust? What's up in the forest of your family trees? Do we really believe this before we see it?